Donovan Williams' mother certainly was keeping busy in the last week or so preparing for Donovan's return to his native Virginia. By Williams' count, at least 20 family members and friends will be at Scott Stadium tomorrow afternoon when UConn plays its 2017 road opener against Virginia. "It is going to be pretty exciting," Williams said. "I have a lot of family, friends who are going to come out to the game so I am definitely going to do my best. She is helping me keep track of who is coming and how many tickets I need." Williams, one of four Virginia natives on the team, has had an eventful 16 months at UConn. He came in considering to be the Huskies' quarterback of the future and after looking like he would redshirt for the entire season. 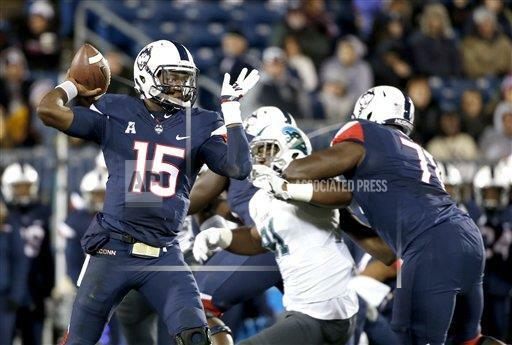 However, with three games left in the season former UConn coach Bob Diaco made the decision to burn Williams' redshirt as he started against Temple, Boston College and Tulane. Williams came into spring camp looking to make a run at extending his starting quarterback gig but an injury early during spring practice eventually resulted in a change of plans. When preseason practice kicked off, it didn't take Williams long to figure out that junior college transfer David Pindell and veteran Bryant Shirreffs were at the forefront of the quarterback position. Eager to get on the field, Williams approached UConn coach Randy Edsall and his move to receiver was underway. "Missing the majority of spring, I came in during the first week and a half ready to work," Williams said. "I see myself contributing at wideout because I did spent a year at wideout in high school so I felt like I could contribute there." Williams caught 11 passes for 171 yards and a touchdown as a sophomore. Williams worked exclusively at quarterback in his final two high school seasons as he threw for 2358 yards with 23 touchdowns and five interceptions while running for 1503 yards and 27 touchdowns leading Hylton to an 18-2 record playing for former NFL defensive back Tony Lilly. "Coach Lilly is a great guy, a great coach," Williams said. "He gave me an insight and definitely helped me during my high school career he is probably why I am here today." Williams isn't on the two-deep chart at receiver but is on every special teams unit. "He is a really good athlete, he understands things," Edsall said. "The other things he has made strides on is special teams. Now we are able to use him on special teams. I like the approach he has taken to the position and how he tries to go out there, works each day to get better." It's uncertain if any of the other three Virginia natives will get into the game. Linebacker E.J. Levenberry would have been in position for a key role as a senior but the Florida State transfer injured his knee during spring practice. When I spoke to Levenberry the day before the first practice of preseason camp, he was holding out hope of playing this season although Edsall has gone on record as feeling that might not happen. Freshman defensive back Abiola Olaniyan has also been sidelined while there's a chance reserve offensive lineman Brendan Vechery could see some time and he certainly figures to be a part of the travel squad.